WAYNE, NJ., May 23, 2016, One of the biggest challenges with keeping cool in the summer is choosing the right air conditioner for your needs. 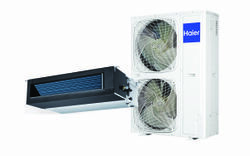 Haier is the source, and can guide consumers through the process of picking the right one. The AC SmartSelector, available at www.haieramerica.com/find-your-cool, allows consumers to find their ideal unit by focusing on room size, installation (wall mount, window), window size, heat and/or cool options and outlet capability. Ductless mini-split system air conditioners place the condenser outside the building and the evaporator or air handler is installed on an inside wall. The units are connected by refrigerant tubing and electrical lines through a hole in the wall which can’t be seen. The main advantages of mini-splits are their small size and flexibility for zoning or heating and cooling individual rooms. There is no need for duct work but a professional installation is required.